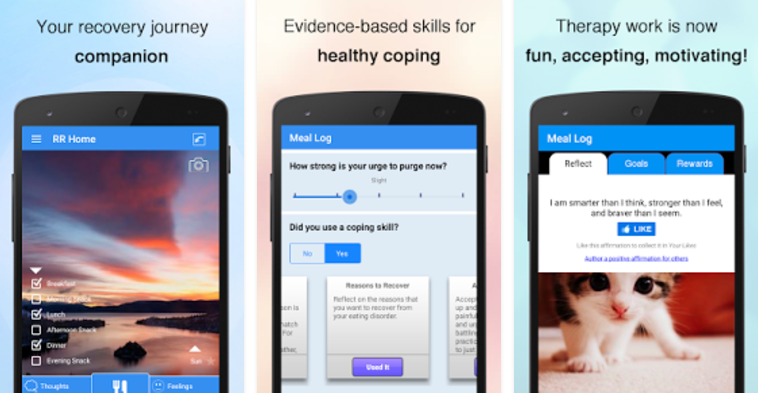 Recovery Record is a mobile- and web-based program designed to assist users in the recovery process from eating disorders. The program has two versions: a patient program (free) and a clinician program (paid after first patient). The developers recommend the program for users who are in treatment. The program’s main feature is a meal log to be completed several times a day, according to the user’s personal goal (as decided by the user/clinician). The log contains documentation of each meal (with an option to add a picture), a mood tracker, details about the surrounding conditions of the meal (location, companionship, etc. ), behavioral aspects (“Did you count calories?”), and a thought diary. Submitting a meal log rewards the user with a positive affirmation phrase and a comforting image, along with pieces of a puzzle that reveals a hidden reward. The data entered are saved and can be viewed in text or graphic form. When using the program as part of ongoing treatment, the clinician (who must be a “Recovery Records for Clinicians” user) is able to see data logged by their patients and send them messages via the program. A “Personalized” section that enables users to select the design and content of the program’s features: a meal planner, goal selection, and meditations. Throughout the program, anonymity and discretion are emphasized. For example, a user can customize “discreet reminders” for each meal (e.g., “Call Sarah after morning snack”). Clinician connectivity/personalized meal log/ free. Complicated for the first-time user. Recovery Record is a program that is mostly suited for users in the recovery process from eating disorders, designed to be an adjunct to treatment. The program provides a professional, personalized and detailed meal log that could offer a good solution to the long process of recovery. The program’s overall approach is supportive and reassuring, as reflected in the constant and various ways users are encouraged to use the program, have their spirits lifted, and access support. Using the program as part of ongoing treatment adds an additional layer of close supervision and handholding. On the down side, Recovery Record is somewhat complicated, and for the first-time user, not all of the program’s features are easily and intuitively reachable. A clear tutorial leading the user through the various features and a better layout could prevent the initial confusion. Furthermore, while the current feature of viewing others’ activities seems to be quite helpful, additional features embedding social/peer support could benefit the users. Recovery Record could be mostly beneficial, as described, as a supplement to ongoing treatment for patients in the recovery process from different eating disorders. Clinicians that use the program can track one or several patients’ daily reports and send messages through the program. Having the information documented in real time allows clinicians to follow patients’ progress closely and assess their compliance with therapeutic goals; this enables discussion and adjustment in the subsequent session.